Researchers from the Children’s Environmental Health Center in the Department of Preventive Medicine at Mount Sinai were recently invited to lead a workshop at a teaching institute conducted by The Children’s Environmental Literacy Foundation (CELF). CELF is a Stakeholder Advisory Board member of the Community Outreach and Engagement Core (COEC) at the Transdisciplinary Center for Early Environmental Exposures at Sinai. 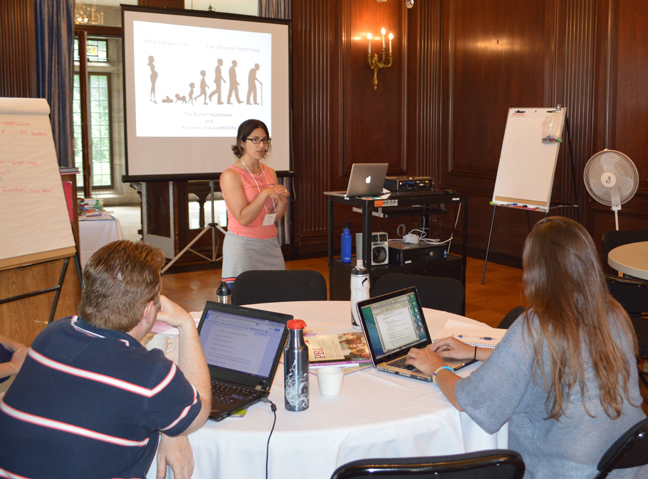 The Institute, held from July 20-23 at Manhattanville College in Purchase, NY, consisted of a series of full-day professional development sessions and drew teachers from across New York, New Jersey and Connecticut. The workshop featured an all-star line-up of expert speakers promoting methods that enable teachers to integrate concepts of environmental sustainability into lesson plans for a wide range of academic topics and student ages. At the workshop, Dr. Sarah Evans and Dr. Alison Sanders, both postdoctoral fellows, discussed how pediatric environmental health topics can be incorporated into the K-12 curriculum. Dr. Evans introduced key concepts such as the unique vulnerability of children to environmental health risks and transgenerational effects of chemical exposures, and proposed ways in which they can be integrated into both STEM (science, technology, engineering, and mathematics) and non-STEM classrooms. Dr. Sanders, who also directs an afterschool science program for East Harlem fifth graders, presented her research on toxic metal exposures and epigenetics along with hands-on examples of how to translate her and others’ cutting-edge research into classroom lessons and activities. The invitation to participate in this event was an excellent opportunity to share current research being conducted at Mount Sinai with classroom teachers as part of our mission to promote environmental health education and engagement. This entry was posted in Feature of the Month on July 25, 2015 by mountsinaitceee.